Eric Doden, CEO of Greater Fort Wayne Inc., sits down with Paul Singh to discuss all things startups, entrepreneurship, economic development, and investment strategies. If you’ve ever wanted to be a fly on the wall for a meeting of two business powerhouses, this is your chance. Discounted/Free tickets are available, please contact crystal@fwelectricworks.com for more information. Paul Singh will share his tips on how to pitch to an angel or VC investor. Great for founders at any stage in their startup. Having a beautiful website that clearly articulates your company's value prop, products and services is table stakes. It also needs to have a behind the scenes technology strategy. Paul will share tips and tricks on how to use online techniques to increase sales. Through this 90-minute interactive program you will learn some of the basic principles of design thinking to start using for your personal and professional goals. Whether you want to start a business, invent a new product, or improve a service design thinking helps you identify the needs, create a plan, and develop a prototype to test your ideas. 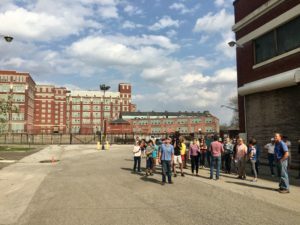 Get an up-close look at the former General Electric campus. Learn about its past and present – as well as our vision for its redevelopment and rebirth. These small, guided tours are available on a first-come basis and are free of charge. Click here to register online.